The ABCs of the V.A.D. 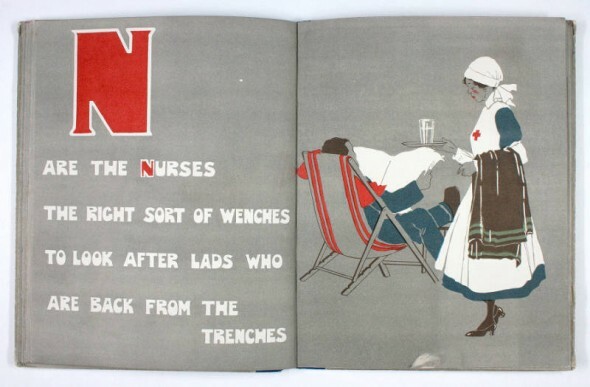 The Voluntary Aid Detachment started in 1909 when the War Office placed on the British Red Cross responsibility for forming and training VADs in every county to provide additional aid to the territorial medical service to meet the needs of war. Detachments were also formed by the Order of St. John and St. Andrews’ Ambulance Brigade in Scotland. The VADs were made up of both men and women who gave their time voluntarily and who underwent a detailed training programme including lectures and practical field days. To qualify for VAD membership, women had to pass first aid and nursing qualifications and men first aid qualifications. These examinations had to be regularly renewed. In March of 1911, a uniform was introduced and on qualifying as a British Red Cross VAD, a new member would be permitted to sew the distinctive Red Cross emblem onto her apron and later onto her head veil. 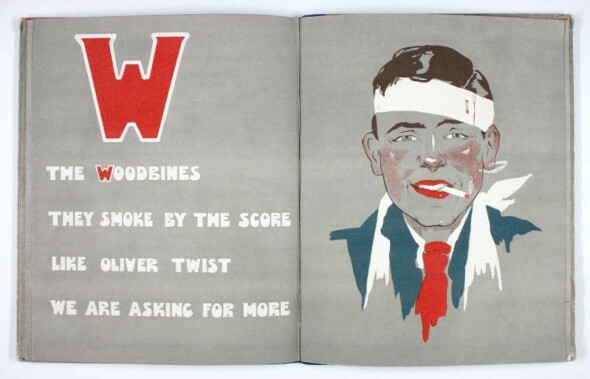 Although the VAD scheme was originally intended to provide voluntary aid in times of war, it was soon realised that practical experience was necessary and VADs began to help in hospitals and dispensaries during peace time. The first public first aid duty was carried out at the Coronation of King George V when “Red Cross squads” were stationed along portions of the route. The First World War saw the VADs fully mobilised and carrying out duties both at home and abroad. Amongst their functions were the transportation of the wounded, the supervision of dressing stations, cooking and nursing duties in both military and auxiliary hospitals. By the Armistice, there were over 90,000 British Red Cross VADs and a tradition of voluntary service with the Red Cross that continues to this day was well and truly established. Joyce Dennys served with the Budleigh Salterton Auxiliary Hospital, which contained some twenty beds, from December 1914 until December 1915 and then served at the Number Two Military Hospital in Exeter, which had some 220 beds, from January to October 1916. 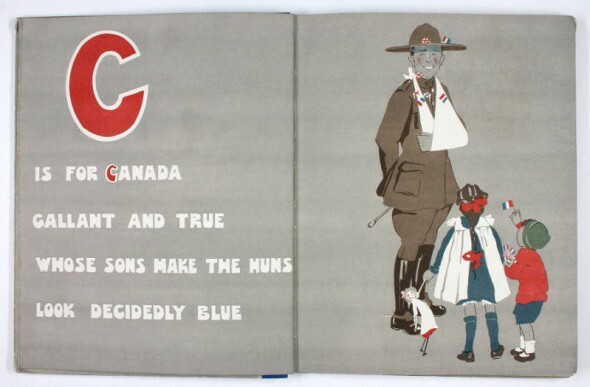 Before the war started, Joyce was attending an art school in London and it was around 1915 that the publishers, John Lane The Bodley Head, commissioned her to draw the pictures for “Our Hospital ABC” with verses by Hampden Gordon and M.C. Tindall. This was followed by “Our Girls in Wartime”, with rhymes once again by Hampden Gordon. Joyce Dennys: service at Budleigh Salterton was at a small hospital used at first for the men of the local garrison and then used exclusively for the men of the Expeditionary Force. The hospital building was lent free by ColoneL M. Barton, RE, DSO and was situated on the high ground overlooking the sea. The Number Two hospital at Exeter was one of five hospitals in and around Exeter which were used for military purposes. The wonderful images that Joyce Dennys drew for the two books are all caricatures and were drawn from what she had seen in and around the Devon hospitals and from life in the great metropolis. From March to September 1917 she was on the staff at Devonshire House which was the office from which all VAD administration was carried out. It was during this period that she must have visited the County of Cornwall Royal Naval Auxiliary Hospital, Truro. The hospital, with 150 beds, was located in the Truro workhouse, a roomy well-ventilated building standing on a healthy, open site. a mile out of the city. Now, as I said, I can do social history, I can do politics, I can do food, and I can even do diplomacy, but the military goes right over my head (Shh, don’t let my very military family hear this! ); however, since WWI looms largely over both Downton Abbey and the Edwardians, it behooves me to do my bit and research the basics of the Great War (though naturally, I do get caught up in the spy stuff!). 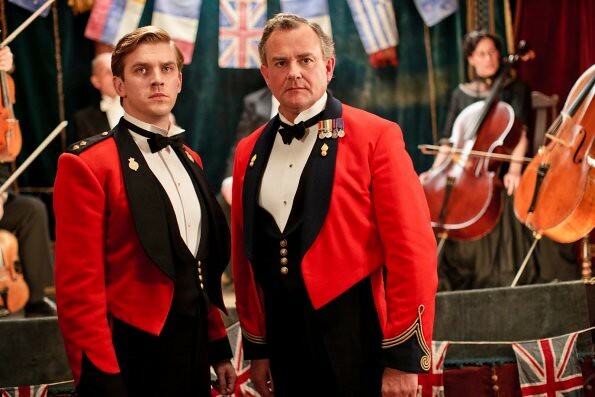 According to the Downton Abbey companion book, the regiments of Lord Grantham and Matthew Crawley, the North Riding Volunteers and the Duke of Manchester’s Own, respectively, were created for the series, and Lord Grantham’s mess kit was copied from that worn by an officer in the Indian Guides in 1912. The British soldier went to war in August 1914, wearing the 1902 Pattern Service Dress tunic and trousers. This was a thick woollen tunic, dyed khaki. There were two breast pockets for personal items and the soldier’s AB64 Pay Book, two smaller pockets for other items, and an internal pocket sewn under the right flap of the lower tunic where the First Field Dressing was kept. Rifle patches were sewn above the breast pockets, to prevent wear from the webbing equipment and rifle. Shoulder straps were sewn on and fastened with brass buttons, with enough space for a brass regimental shoulder title. 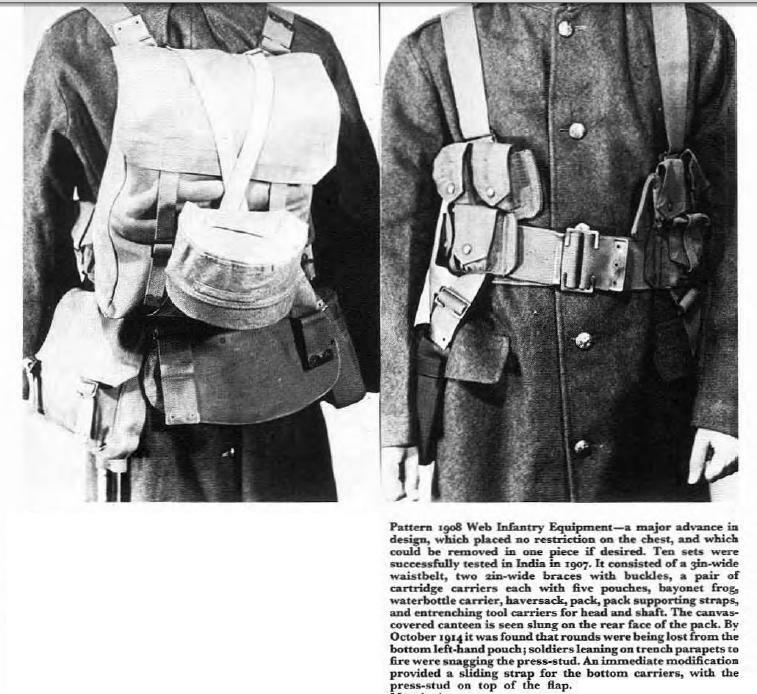 The 1908 Pattern webbing equipment comprised a wide belt, left and right ammunition pouches which held 75 rounds each, left and right braces, a bayonet frog[jargon] and attachment for the entrenching tool handle, an entrenching tool head in web cover, water bottle carrier, small haversack and large pack. A mess tin was worn attached to one of the packs, and was contained inside a cloth buff-coloured khaki cover. Inside the haversack were personal items, knife and when on Active Service, unused portions of the daily ration. The large pack could sometimes be used to house some of these items, but was normally kept for carrying the soldier’s Greatcoat and or a blanket. The full set of 1908 webbing could weigh over 70 pounds (32 kg). Thus ends my first foray into actual military matters! For those who are very interested in the minutiae of soldiery and trench warfare, I highly, highly recommend the books published by Osprey. Their extensive catalog includes books about trench warfare, the uniforms and insignia of all participating armies in WWI, brief but incredibly rich histories of the war, and titles dedicated to the particular branches of service in WWI (and some of them even include women’s uniforms!). 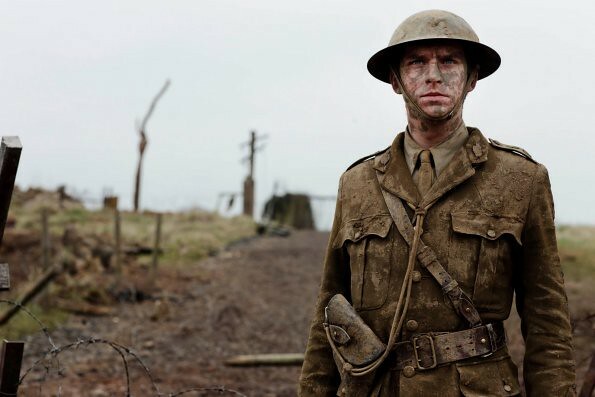 For those who like a general view of the war and life for the soldiers, I recommend Six Weeks: The Short and Gallant Life of the British Officer in the First World War by John Lewis-Stempel, which Dan Stevens (Matthew Crawley) found invaluable to understanding life in the trenches. And of course, don’t forget about the official companion book! As I am but an humble American citizen and cannot legally access the latest season of Downton Abbey, what I can say about the happenings and history of series two will derive from what spoilers I glean from articles and stray tweets. So Edwardian Promenade and I are forced to march out of step with my fellow British Downtonites until it airs on PBS in January. 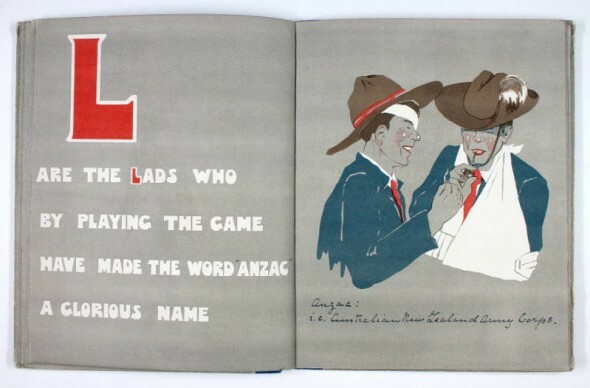 However, never fear, I have many Edwardian & WWI tricks to pull my from hat! 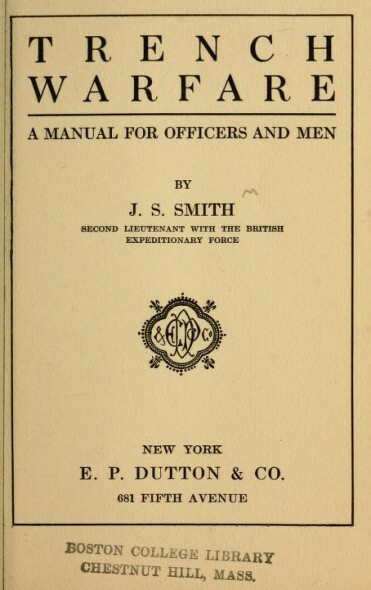 For now, I direct you to Trench Warfare: A Manual for Officers and Men (1917) by J. S. Smith.